I grew up in Northeast Iowa on a family farm, where we grow corn, raise cattle and have horses. Growing up, I remember riding around in the tractor with my dad just for the fun of it. Today I still ride in the tractor with my dad, but now I do so having a greater depth of knowledge of farming and conservation as a whole. As an Agricultural Studies student at Iowa State University, I run into so much diversity through my classes. I get to hear different perspectives on farming, land stewardship, natural resources, ranching, raising livestock, and so much more! I’ve learned a lot and gained new perspectives when it comes to using and managing the land. I’ve also gained new perspectives through this summer internship with the Iowa Learning Farms and Water Rocks!, focused on water quality. This summer I have been able to interact with rural and urban community members and teach them about soil and water quality. I visit with active community members who are curious as to what they can do to care for the land we live on. This summer has really opened my eyes. This internship has motivated me to want to see a change in land management before our water quality gets worse, and I have learned more about how we can all work together to do that. Consider what you would have seen walking in Iowa two hundred years ago. A pioneer would have walked on Iowa’s land through vast tallgrass prairie, dotted with abundant wetlands and intersected by rivers. Today, the landscape is vastly different – I walk around today surrounded by crop fields and larger urban areas. I find it hard to want to go swimming in the rivers today because of the pollutants we have in our waters today. I respect farming and its purpose, but we need to find that balance with farming and land stewardship. In the last 200 years we have lost 90+% of our wetlands and 99.9% of our prairie in Iowa. Those prairies and wetlands have very important jobs that act as a habitat and a filter for getting rid of possible pollutants. Now, as an agricultural student I understand how chemicals are being used and how much soil is getting exposed. These are two of many pollutants that we find in our water bodies today. We all need to work together and try to eliminate the amount of pollutants that are getting into our water bodies. This summer I have been able to learn about the multiple conservation solutions we have available to us. In both rural and urban areas we are trying to reach out to landowners and introduce them to practices that can eliminate some of the pollutants in our water. During this internship, we discuss how buffer strips, wetlands, bioreactors, saturated buffers, cover crops and no till can lead to improvements in water quality. I have also learned that urban communities can help out by putting in permeable pavers and installing green roofs. These practices are great ways to start protecting our soil and water. However, one big challenge is that the improvements we want to see will not happen overnight because they take money and time. Not only that, but it takes everybody’s help to see a change. It is all of our responsibility to make sure we are doing what we can to prevent polluted water bodies and protect our great Iowa soil. We’re all in this together! Taylor Kuehn, a New Hampton native, is participating in the 2018 Water Resources Internship Program. In the fall, she will be starting her senior year at Iowa State University, majoring in Agricultural Studies. July 19, 2018 astaudt	intern, internship, Iowa Learning Farms, natural resources, outreach, soil, Stewardship, student, summer internship, water, water resources, Water Rocks! Today’s guest blog post comes from student intern Kaleb Baber, majoring in Agronomy and minoring in Geology at Iowa State University. Kaleb grew up on a family farm near Weston, MO, where he grew sweet corn, raised beef cattle, and was actively involved in FFA. We’re thrilled to have Kaleb back for a second summer in the Water Resources Internship Program! My coworkers and I all stared at each other like deer in headlights. It was a simple question, but one none of us had given much thought to. What did inspire me? Why did I care so much about water resources? Panic began to set in. I wanted to give a thoughtful answer to the student, but my mind was drawing a blank. With a room full of fifth graders starting up at me, I finally came up with something. When I think about water, some of my favorite memories come to mind. I love being outdoors, so naturally I am outside whenever I have the chance. Growing up, it was a summer tradition for my family to go fishing in Ontario. I did not realize it at the time, but looking back now I realize that those family vacations when I was little helped shape my interests going forward. Since those fishing trips, I have been fortunate enough to travel to some truly amazing places. In some places, like Yosemite Valley, the role of water in the landscape is obvious as waterfalls tumble over the towering walls of granite forged by massive glaciers. In other places, like the endless red sandstone of southern Utah, water is rarely seen. However, its effects have made a lasting impression by sculpting incredible rock formations through weathering and erosion. From the secluded lakes of Michigan’s Upper Peninsula to the powerful Colorado River that carved the Grand Canyon, water and its influences are all around us. Water is one of our most important natural resources, and I firmly believe that the best way to understand that is to go experience it firsthand. I am so grateful to have had these adventures, and I know for a fact that my passion for the outdoors began as a child on my family’s fishing trips to Ontario. So to answer the student’s question, what inspires me to intern for Water Rocks! and Iowa Learning Farms is the memories I have made thanks to our water resources. Those memories inspire me to go outside and get up close and personal with nature. They inspire me to do my part in conserving our natural resources. And most of all, they inspire me to share the importance of clean, healthy water with others in hopes that they will make memories of their own. June 15, 2018 astaudt	intern, Iowa Learning Farms, Iowa State University Extension and Outreach, natural resources, student, students, summer internship, water, water resources, water resources internship, Water Rocks! Meet Our 2018 Water Resources Interns! We would like to warmly welcome our new crew of interns for the 2018 summer outreach season! These students come from farms across Iowa and Missouri and are ready to share their knowledge with you. Stop by our trailers this summer and say hi. Catch our interns at your local county fairs, farmers markets, field days and more. For a full list of summer events, see our website. The interns will also be playing a role in field work and data collection for research projects with Iowa State University’s Ag Water Management research group. Wyatt Kaldenberg is from a family farm near Indianola in south central Iowa and is majoring in finance at Iowa State. He will be a junior this fall. Taylor Kuehn is from a family farm near New Hampton in northeast Iowa and majoring in agricultural studies at Iowa State. She will be a senior this fall. Kaleb Baber grew up on a family farm near Weston, Missouri, just north of Kansas City. He is pursuing a degree in agronomy and a minor in geology at Iowa State. Kaleb will be a senior this fall. We are thrilled to have Kaleb back with our program for a second summer! Donovan Wildman is from a family farm near West Branch in east central Iowa and is majoring in agricultural and biosystems engineering (land and water resources engineering option) and minoring in agronomy at Iowa State. He will be a sophomore this fall. Dawn Henderson is from a family farm near Marcus in northwest Iowa. She is majoring in agronomy and will be heading into her senior year at Iowa State this fall. We are happy to have our interns on board! Watch for their social media posts on Iowa Learning Farms and Water Rocks! pages as well as their reflections on their internship experience on our blog. It may be January, but we are already looking ahead to the summer months as we are actively in search of outstanding undergraduate students for our water resources summer internship program! 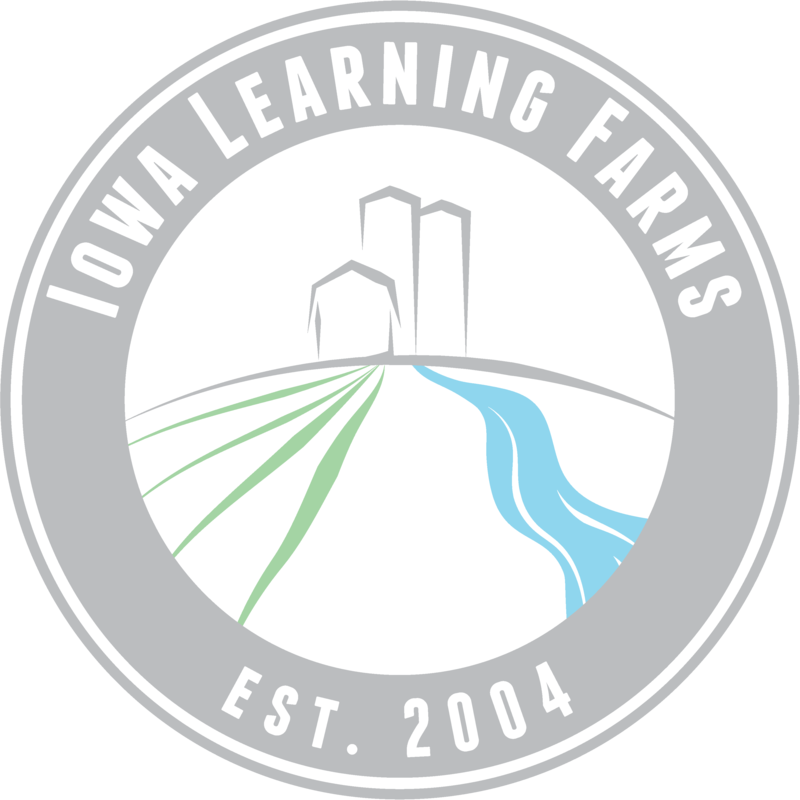 Want to join Iowa Learning Farms and Water Rocks! for the summer? We are looking for students that are energetic, enthusiastic, hard workers, with interests in agriculture and the environment, especially soil health and water quality! The water resources internship program is based on campus at Iowa State University, but is not limited to ISU students – our program is open to undergraduate students from any institution across the country. In the past two summers, we’re worked with students from ISU, Hawkeye Community College, Grinnell College, Drake University, and the University of Georgia. This is a paid internship opportunity, with students having the opportunity to work up to 40 hours per week. Monday: Morning staff meeting, followed by trip to ISU Northern Research Farm at Kanawha to collect water samples from suction lysimeters in cover crop plots. Tuesday: Travel to a youth summer camp and help students learn all about soil + how to protect it. Wednesday: Another day in the field… counting earthworm middens in side-by-side plots with and without cover crops. Thursday: Outreach Event…Travel with the Conservation Station to a county fair; teach the hands-on, interactive Watershed Game to fairgoers of all ages! Friday: Morning = soil processing in the lab, then help out with a new Water Rocks! video production in the afternoon! Past participants in our internship program have gone on to such careers as project engineer, watershed coordinator, environmental educator, field research specialist, and USDA-FSA program technician, while others have pursued graduate school opportunities and even been accepted into the Peace Corps. Applications for the water resources internship program are open now through Monday, January 25. Visit our 2016 Water Resources Internship Program page for additional details and application instructions! Do you know an undergraduate student that would be a great fit? Send them our way – we are looking forward to a great year ahead! Iowa Learning Farms and Water Rocks! 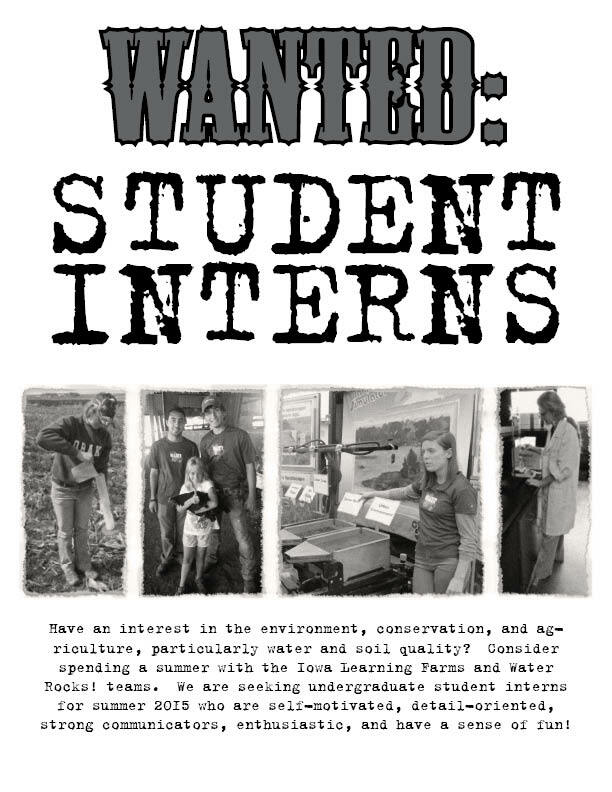 are in search of undergraduate student interns for our 2015 Water Resources Internship Program. The paid internship program is based on campus at Iowa State University and will involve travel to research sites and various outreach events around the state. Internships begins Monday, May 11 and run through Friday, July 31, 2015. Visit the 2015 Water Resources Internship Program page for additional details and further information about how to apply. The application deadline is Friday, February 6.